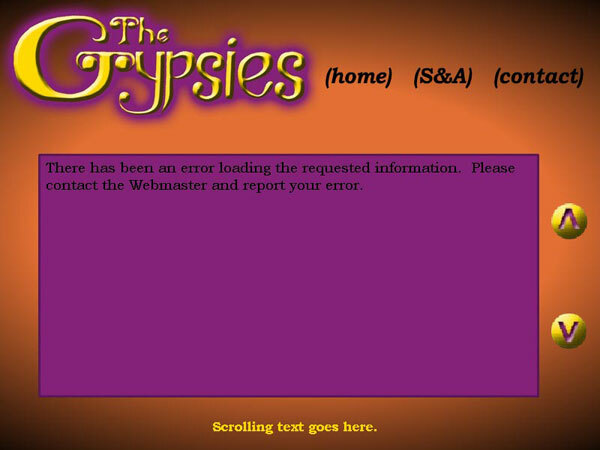 This is a website I created to go along with a logo for a group of Dominants called "The Gypsies" in early 2006. I'm not even going to try and post anything other than an image of what the site was supposed to look like, as I never got the damn thing working properly. Most of the time it looked exactly as it's pictured above. Needless to say, as most of my Flash efforts have been, the creation of this site resulted in a great amount of frustration, hair pulling, and profanity hurling. I just can't seem to wrap my brain around Actionscript. It seems so simple and straightforward, but I always seem to leave out a crucial comma or period, and the whole thing falls apart. The group disbanded shortly after it was created, a result of too many cooks spoiling the broth I suppose, so I only worked on the site off and on for a few weeks. I hope you like the image of the site at least, even if the site was never finished. All artwork Copyright © 2006 Nathan Edward Williams. All rights reserved.